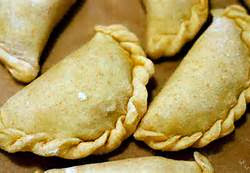 make vegetarian empanadas, chicken empanadas, beef empanadas, and it can either be fried or baked in the oven as well. The combinations are endless depending on the type of filling you want residing in the empanada. In the episode Tostadas and Empanadas (Season 11, Episode 3), ATK chef Bridget Lancaster shows Chris Kimball how to make a Chilean empanada with a beef filling inside. The use of tequila to make the empanada dough gave me an initial sense of hesitation when trying this recipe. In general I don't drink alcohol all that often, so anytime a recipe calls for alcohol whether it's a beer for a batter, wine for a sauce, or brandy in a dessert, I'm somewhat hesitant. I just don't like the alcohol taste in my food even though I know most of it will burn off in the cooking process. My initial fears though were put to rest because I didn't taste any trace of tequila in the empanada dough. Thankfully, the dough was easy to put together with the use of my trusty food processor. Also, in regards to the dough, you can easily find the masa harina at your local grocery store. I've never heard of it prior to making this recipe, so I thought I had to go to some specialty store to buy some until I found it in the baking aisle next to all the other flours at my local store. You may also be able to find it in the international aisle of your local grocery store. I think it's common enough that you can find it mostly anywhere and you don't have to go out of your way looking for it. I didn't change much from the original recipe. I made the dough exactly as specified in the recipe and the filling was quite good too. I really liked adding the chopped eggs and especially the cilantro to the filling. If you've read my post on ATK's chicken tikka masala, then you know that I love cilantro. I know many of you don't care for cilantro, but I find the cilantro really complements the filling that goes well in Latin flavors. The only thing I changed was that I left out the olives only because in general I don't like olives. Olives have a distinct flavor that I just isn't my cup of tea. I also left out the raisins. I actually like raisins. I put raisins in my oatmeal, cereal, yogurt, and I like Raisinettes (chocolate covered raisins). Raisins cooked in a savory dish, however, are a different story. I find that cooked raisins get a strong and overwhelmingly sweet flavor that takes over the flavor profile of whatever it is that they are in. If I leave the raisins and bite into these empanadas, all I taste are raisins which is what I absolutely don't want. What also makes this recipe easy is the fact that you don't have to deep fry it. Don't get me wrong...frying it in oil definitely makes it taste good, but baking it in the oven is healthier. Furthermore, frying it does take more work and it can get messy as well. Popping it in the oven does make it easier though and less greasy. When I decide to make these empanadas either as an appetizer or tapas, I like to make smaller empanadas. Instead of making a dozen empanadas, sometimes I'll just make 18 smaller ones. Beef Empanadas crimped with roped edges. Ok now this is just extra credit. The way I sealed the empanada was that I used a fork to crimp the edges which is what they do in the episode and is a common technique that is easy and simple to do. I've seen in some places (like Argentina), the way you seal the edges is almost like an art. You can even fold the edges on itself over and over again such that the edge looks like that of a rope (pictured below). You can try it out and make your empanadas a little more fancy looking. You can even fold your empanadas into triangles if that is a little easier for you instead of half moons. There's just a whole bunch of different possibilities that you can play around with when shaping your empanada. 1. FOR THE FILLING: Process bread and 2 tbsp chicken broth in food processor until paste forms, about 5 seconds, scraping down sides of bowl as necessary. Add beef, ½ tsp pepper, and ¾ tsp salt and pulse until mixture is well combined, six to eight 1-second pulses. 3. FOR THE DOUGH: Process masa harina, 1 cup flour, salt, and sugar in food processor until combined, about two 1-second pulses. Add butter and process until homogeneous and dough resembles wet sand, about 10 seconds. Add remaining 2 cups flour and pulse until mixture is evenly distributed around bowl, 4 to 6 quick pulses. Empty mixture into large bowl. 4. Sprinkle tequila or vodka and water over mixture. Using hands, mix dough until it forms tacky mass that sticks together. Divide dough in half, then divide each half into 6 equal pieces. Transfer dough pieces to plate, cover with plastic wrap, and refrigerate until firm, about 45 minutes or up to 2 days. 5. TO ASSEMBLE: Adjust oven racks to upper- and lower-middle positions, place 1 baking sheet on each rack, and heat oven to 425 degrees. While baking sheets are preheating, remove dough from refrigerator. Roll each dough piece out on lightly floured work surface into 6-in circle about ⅛ inch thick, covering each dough round with plastic wrap while rolling remaining dough. Place about 1/3 cup filling in center of each dough round. Brush edges of dough with water and fold dough over filling. Trim any ragged edges. Press edges to seal. Crimp edges of empanadas using fork. 6. TO BAKE: Drizzle 2 tbsp oil over surface of each hot baking sheet, then return to oven for 2 minutes. Brush empanadas with remaining tbsp oil. 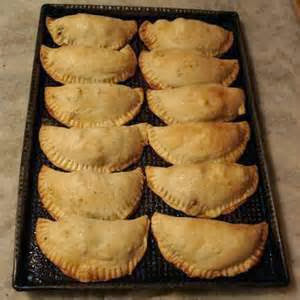 Carefully place 6 empanadas on each baking sheet and cook until well browned and crisp, 25 to 30 min, rotating baking sheets front to back and top to bottom halfway through baking. Cool empanadas on wire rack 10 min and serve.